The LIXIL Group seeks to create a fair and rewarding workplace, develop a strong and cohesive corporate culture, and foster an open atmosphere between the unions and the company. The LIXIL Group strives to create an environment that encourages employee diversity, inspires pride in the company, and enables each individual employee to maximize their productivity and their potential. We have focused on improving our work styles to ensure employees’ enthusiasm and motivation, and revising our human resource systems to encourage employees to take paid holidays; this includes offering more comprehensive childcare and nursing care support, and promoting personal career development. At the LIXIL Group, the executive management team is actively supervising the creation of a rewarding working environment in which each and every employee can perform to their full potential. 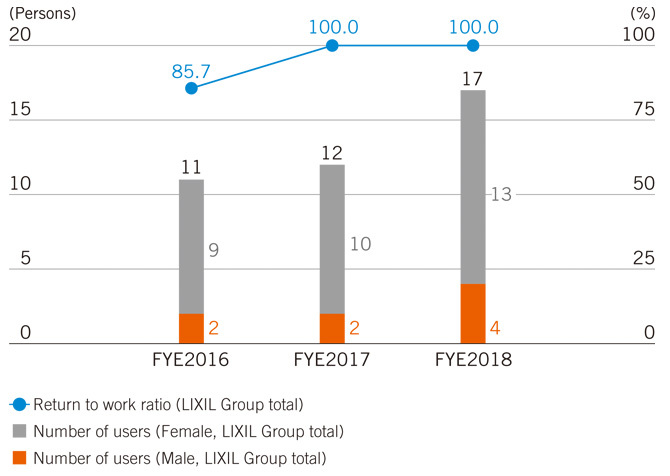 Holding active Work-Life Flexibility (WLF) Advisory Discussions between the union and the company, LIXIL Corporation is committed to enhancing the necessary systems and cultivating the right atmosphere. We currently have support practices in place for female employees looking after young children, and are now focusing on supporting our male employees with their childcare commitments, in addition to supporting all employees looking after sick or elderly relatives. LIXIL Group top management are proactively seeking to improve productivity by eradicating long working hours and ensuring a healthy work-life balance. To encourage employees to actively reduce overtime, LIXIL Corporation has designated Wednesdays to be a no-overtime day and has implemented an advance declaration policy for overtime. From FYE2016, managers and staff are required to carefully manage their working hours. Employees who consistently work long hours are interviewed by an industrial physician to prevent mental/physical health issues. 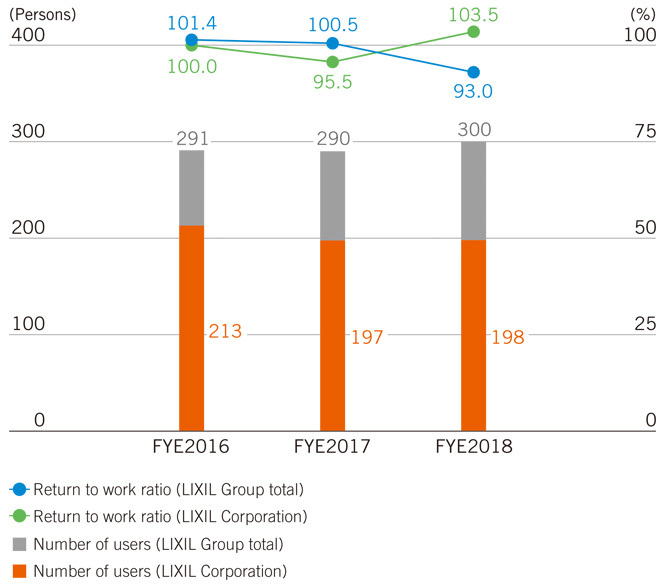 The usage of paid leave has been increasing as of FYE2015, when we introduced measures such as “memorial leave,” which enables employees to take off time whenever they want for personal anniversaries, while we have also encouraged employees to take five consecutive days of annual leave at a time. 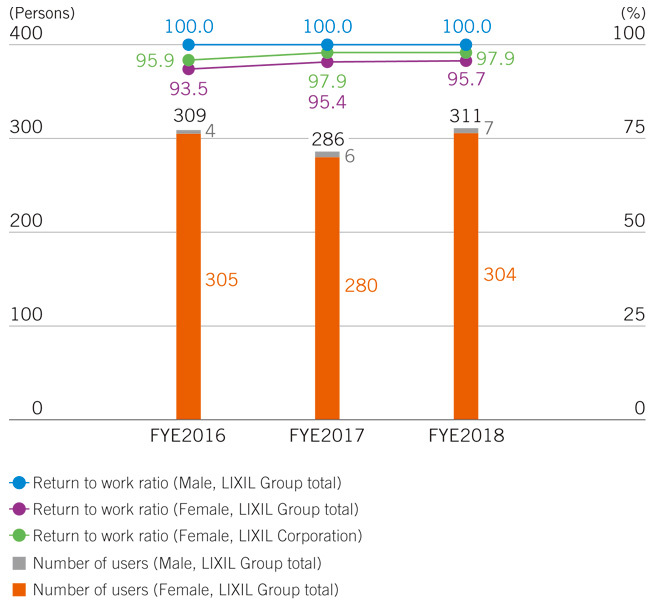 As a result, paid-leave usage is over 50% in 2017. We intend to continue working to increase this ratio even further.